Home » Our Doctors » Duane M. Schrock, O.D. Dr. Duane Schrock is a native of Florida and attended the University of Alabama at Birmingham. He received his doctor of optometry degree in 1991 from the University of Alabama at Birmingham School of Optometry. Subsequently, he and his wife moved to Mobile where he joined the Department of Ophthalmology at the University of South Alabama. Dr. Schrock started a satellite clinic in Fairhope for the University in 1995. 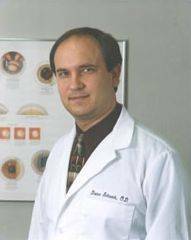 In 2001, he left the University to enter private practice where he continues to provide comprehensive eye care for the entire family. Dr. Schrock resides in Fairhope with his wife, Pauline, and their three children. When he is not at the office he enjoys spending time with his family, fishing, biking and being involved in church activities. Dr. Schrock states that the Eastern Shore Community has been a great place to work and raise a family and he very much appreciates the support and encouragement he has received from his patients over the years. Dr. Schrock sees patients Monday through Thursday and is available after hours for emergency eye care services. He has enjoyed building strong relationships with his patients and is committed to providing quality eye care to patients of all ages.